Guards Polo Club celebrates more than six decades of premier polo in an incredible location. The Club was founded on 25th January 1955 with HRH The Prince Philip, Duke of Edinburgh, as President. Originally named the Household Brigade Polo Club, the name was changed to its present form in 1969 and became a fully civilian club in 2000. Since inception the Club has grown considerably and it is now the largest polo club in Europe in terms of membership and number of grounds. A Board of Directors, headed up by Chairman Brian Stein, oversees the successful running and development of this Club, ably supported by Chief Executive Neil Hobday. There are currently some 1,000 non-playing members and about 160 playing members, among whom are some of the highest rated players in the world. Approximately 25 per cent of the players are overseas visitors from Europe, the Middle and Far East, North and South America, Australia and New Zealand. Around half of the playing members are professionals. The Club has also seen an increasing number of lady players - both professionals and patrons - highlighting the rise in women's polo across the globe. This Club is set in the outstanding natural surroundings of Smith's Lawn, thought to have been named after a gamekeeper at the time of the Restoration in the 17th century. Nearby are the renowned Savill and Valley Gardens. Such a spectacular location, impressive fixtures list and the Club's unrivalled, close relationship with the Royal Family ensures that Guards Polo Club is, without doubt, one of the most famous polo clubs in the world. Smith's Lawn is home to our elegant Clubhouse, featuring a restaurant and bar for members and guests, offering an unrivalled view over the Club's Queen's Ground. There are nine further grounds at this location. Further into Windsor Great Park, at Flemish Farm, Guards Polo Club has developed two additional polo grounds, incorporating a spectacular backdrop of Windsor Castle, and manages 120 stables and an all-weather exercise track at this same location. The Club's season starts in April and finishes in mid September, hosting more than 500 matches each year. 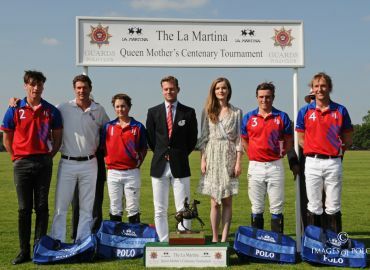 Our premier tournaments include the Cartier Queen's Cup (high-goal), Out-Sourcing Inc. Royal Windsor Cup (medium-goal), Hildon Archie David (low-goal) and Duke of Cornwall Trophy (high-goal). Other key competitions include the Duke of Wellington Trophy, Ladies' Charity Polo Tournament and the Autumn Nations Trophy. The Club has been in the forefront of supporting polo for the young. Throughout the season we host representative matches and tournaments for the Pony Club, and for Schools, Universities and young players from the Armed Forces. This includes the annual La Martina Varsity Day, featuring the best players from Oxford and Cambridge, plus the Inter Regimental final.